You'll be £7.00 closer to your next £10.00 credit when you purchase The Complete Blue Max. What's this? Immelmann – they were among the most famous individuals to be awarded the Kingdom of Prussia's highest military order, the Pour le Mérite, better known as the 'Blue Max'. 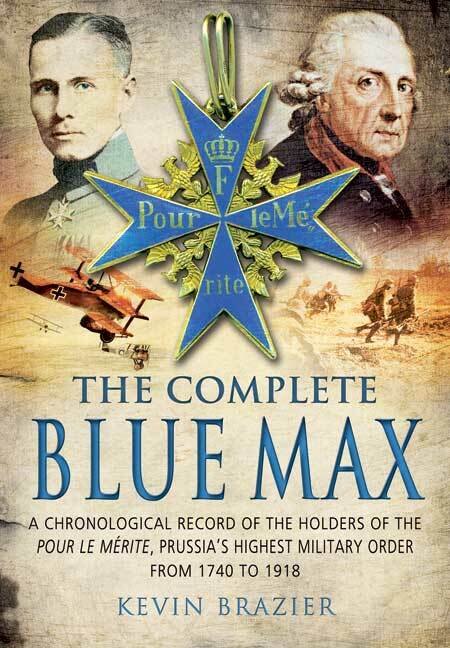 Up until the end of the Great War the Blue Max was the most prestigious accolade a German serviceman could wish for. Yet fictions and myths about the Blue Max have obscured its long and fascinating history. Kevin Brazier, in this comprehensive account of the Pour le Mérite and of the men who received it, aims to set the record straight, and he provides a comprehensive listing of the men who were given this high honour. The names and achievements of the earliest recipients of the Blue Max are listed here, from the time the first honour was given by Frederick the Great, King of Prussia, in 1740. But the book concentrates on the men who were given the award during the Great War when the honour became famous across the world and was used as a propaganda tool by the Germans to celebrate the heroic deeds of their airmen. It is because of these men that the Blue Max is well remembered today, and vivid details of their exploits are the highlight of the book. Kevin Brazier's remarkable work of reference should appeal to anyone who is interested in military history and in the history of honours and medals – and in tales of the extraordinary heroism exhibited by men under fire. This book should appeal to anyone interested in medals, Prussian and German military history and most of all Great War aces.